nC Protect 4400 HDPE Anti Fouling is a transparent coating developed to protect materials from abrasion, corrosion and fouling. It can be applied on (U)HDPE, PMMA, epoxy- and polyuretane coatings and polyester coatings. nC Protect 4400 HDPE Anti Fouling is approved for food contact according to FDA specifications. 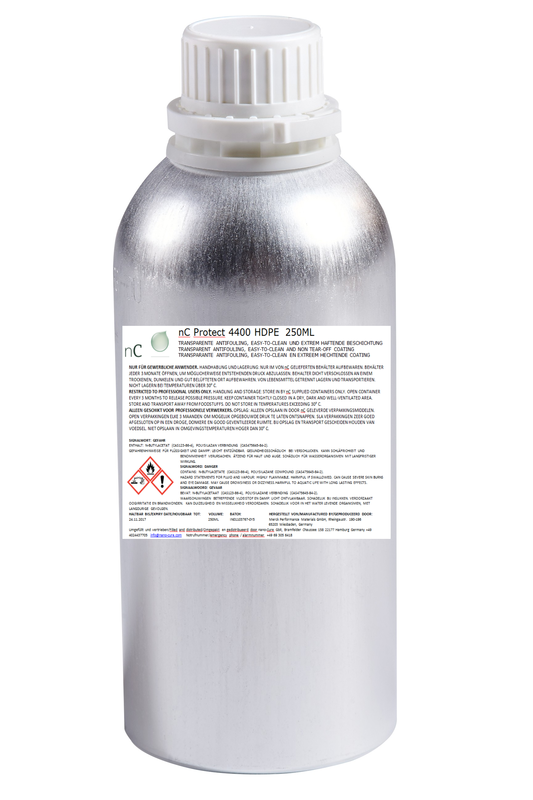 nC Protect 4400 HDPE Anti Fouling bonds chemically into materials and their surfaces. Its ultra-thin, glass-like finish and lasting soiling protection to smooth, non-suction surfaces is used to protect against negative chemical and environmental influences. It is user ready and can be applied by brush, roller, cloth and airgun (HVLP). Do not let nC Protect 4400 HDPE AF make contact with water during application or during cure time (first 12 hours). When in contact with water during application, nC Protect 4400 AF will react with H2O prematurely instead of reacting with the surface, thus influencing the long-term bonding and tear-off rate of the coating. nC Protect 4400 HDPE AF is very thin and fluid, take care not to use too much product! nC Protect 4400 HDPE AF must be applied in one go. Because of the repelling characteristics of the coating, stains, open spots or other mistakes can be repaired within 10 minutes after first application. After 10 minutes, the coating starts to repel any layer that will be applied, including paint, solvent or other fluids. Store nC Protect 4400 HDPE AF at temperatures between 5° C and 30° C.
nC Protect 4400 HDPE AF can be stored for 2 years for unopened containers. nC Protect 4400 HDPE AF is available in containers of 0,25L, 1L and 5L.The product is dry to touch within 2 up to 3 hours. As nanotechnology is about bonding into surfaces and matrices of nanoparticles need to be built up after application, the coating reaches full insulating ability AFTER a cure time of approximately 3 to 5 days, which is dependent upon environmental variables, humidity, and thickness of coat used. Test of maximum performance should be performed after full cure. Benefits will typically begin to be seen approximately 24 hours after application, and will continue to improve as the cure time completes. Cure time won’t interfere with normal operations, you can start using the treated materials after 24 hours and continue to use your equipment as usual while the product cures. Store nC Protect 4400 HDPE Anti Fouling at temperatures between 5° C and 30° C.
nC Protect 4400 HDPE Anti Fouling can be stored for 2 years for unopened containers. nC Protect 4400 HDPE Anti Fouling is available in containers of 0,25L, 1L and 5L.